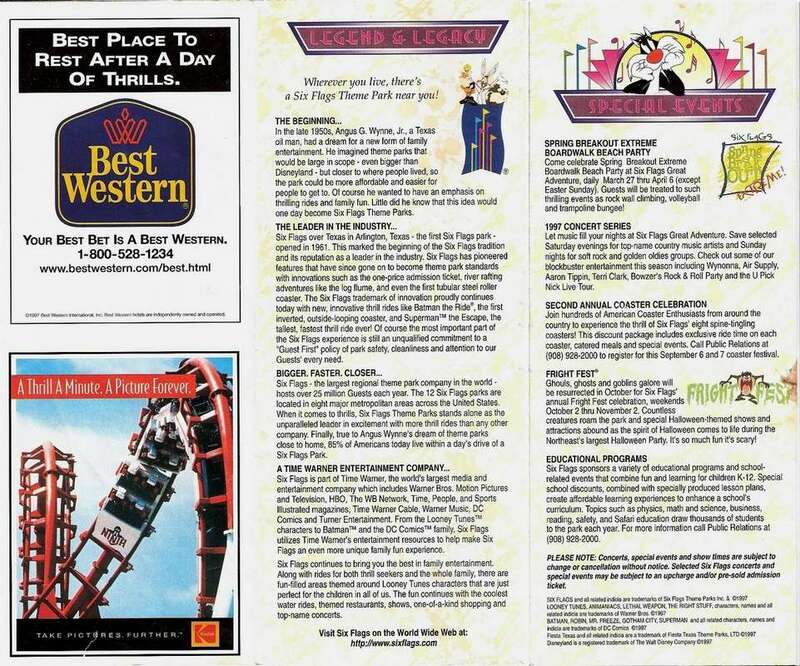 Next up on the Crapstravaganza docket is the 1997 Great Adventure Park Map! Every page now has text to go along with the image as opposed to last weeks installation. On the left and middle we have two stupid ad pages. I’m not sure what the imagery in the Phillips Magnavox ad is trying to convey, but it doesn’t look like look like they made anything better. It’s so 90s it’s amazing. The Skittles ad on the other hand is telling people to bring along loose articles while riding. The ad in the middle is just boring. By the way, there’s a hole in the cover from gum that was stuck to it…responsible collector I am not. Here we go, a little description and artist rendering of the Chiller. I always like how they put people walking around in the image, trying to make it look more realistic in some way. However this image seems to be set not in New Jersey but rather in some interstellar nebula. Seriously, they used an image of the Trifid Nebula. Underneath is a Wild Safari description complete with a tiger. At a first quick glance I thought that the tiger was gnawing on its leg before seeing that it just has its head resting on its leg. 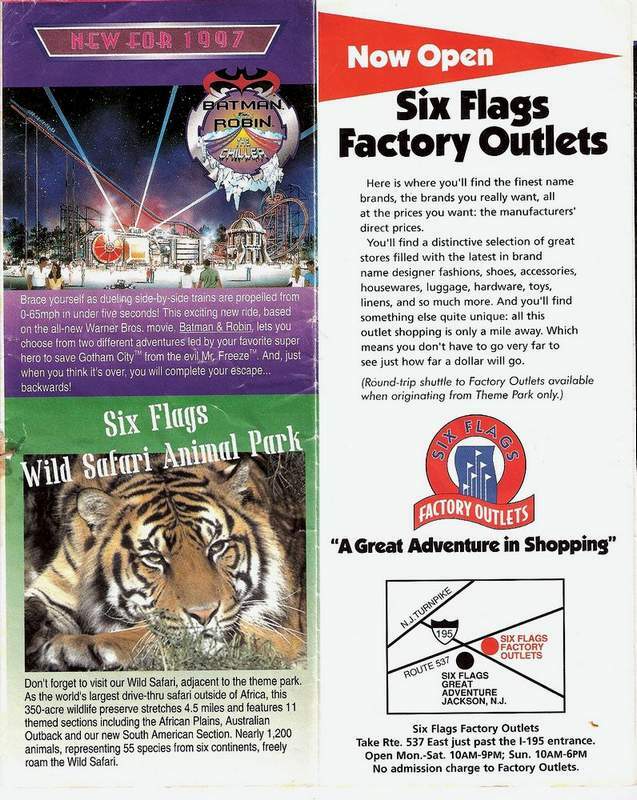 To the right is a Six Flags Outlet plug. I’ve never actually been to the Outlets, maybe I’ll stop by after a GAdv trip one day just for the hell of it. of theme-less no mans land. you’ll be in the car on the way home. Ah hell, it’s just more text and ads. Although they do have a history section which is kind of cool. I like how the Vekoma looper ‘Ninja’ gets some love in that Kodak ad; although it looks like it’s the one at Six Flags St. Louis and not the Six Flags Over Georgia version that used to reside down in Wildwood, NJ. And check it out, the U Pick Nick Live tour came to GAdv! Oh man, I would have picked Adventures of Pete and Pete of Salute Your Shorts! 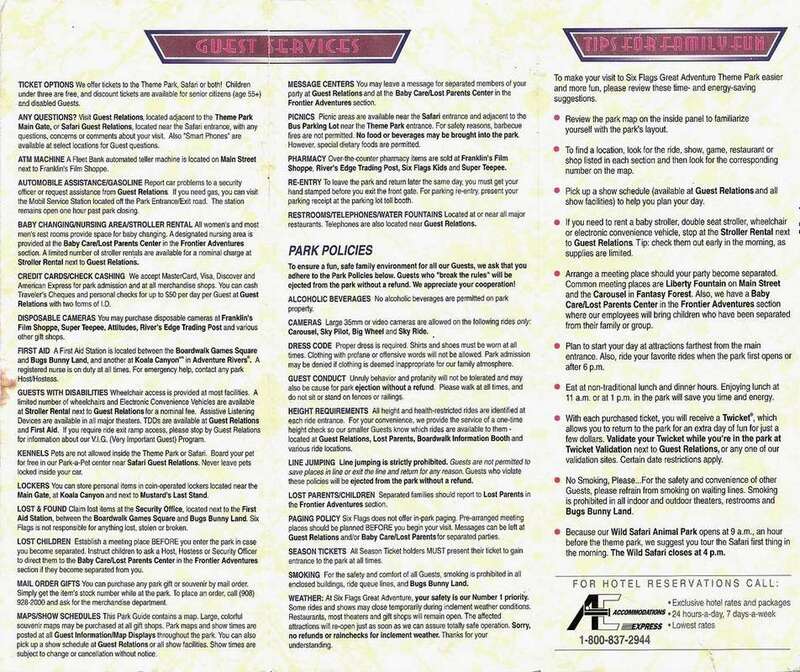 The meat of this particular pamphlet…the map. It looks pretty bare without the likes of Nitro, Medusa, Superman, and Kingda Ka. 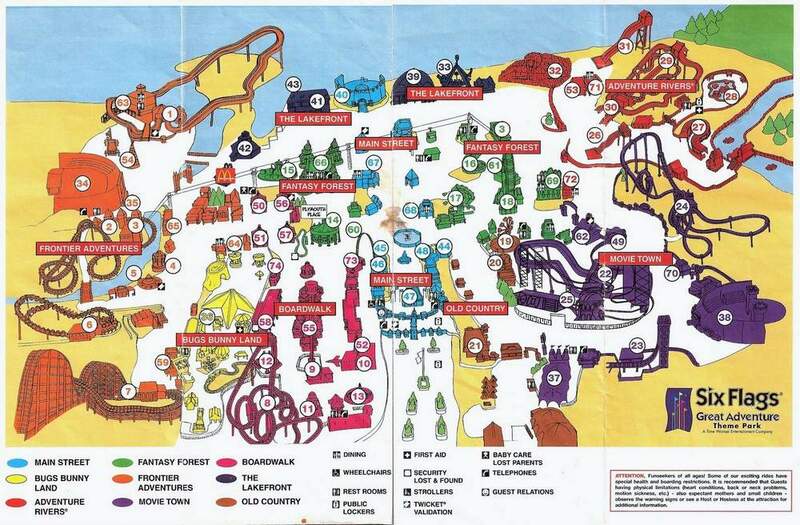 But this map does contain Adventure Rivers which makes up for that in a nostalgic way; I’m still mad that I never got to ride the Asian Tower’s pipeline slides! 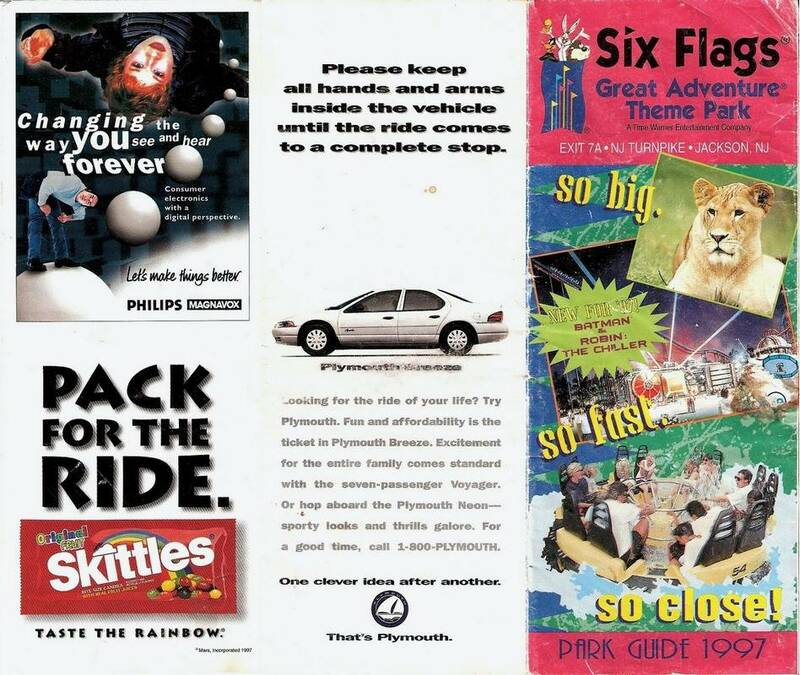 Here’s all the rides, shows and shops of Six Flags Great Adventure in 1997. I always remember that Doc Snooker’s World of Inventions show for being completely out of place in the park. I also remember the Venom Gulch show in Viper’s front yard…an area that actually had some decent theming! 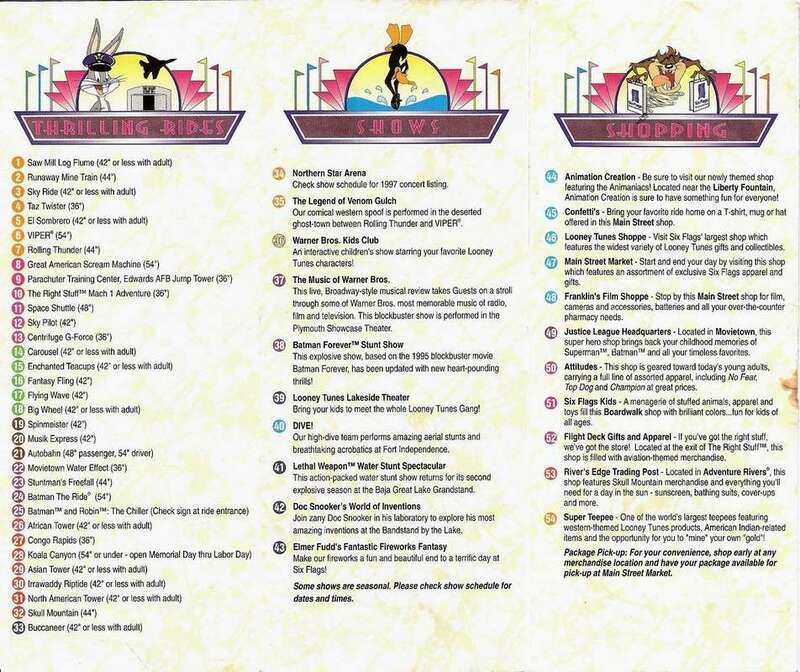 By the way, nice usage of the word ‘menagerie’ in the Six Flags Kids shop description. A lot of the games places are still around in 2008; many of the dining places have been converted to brand name places however. Man I remember Casa de Taco! 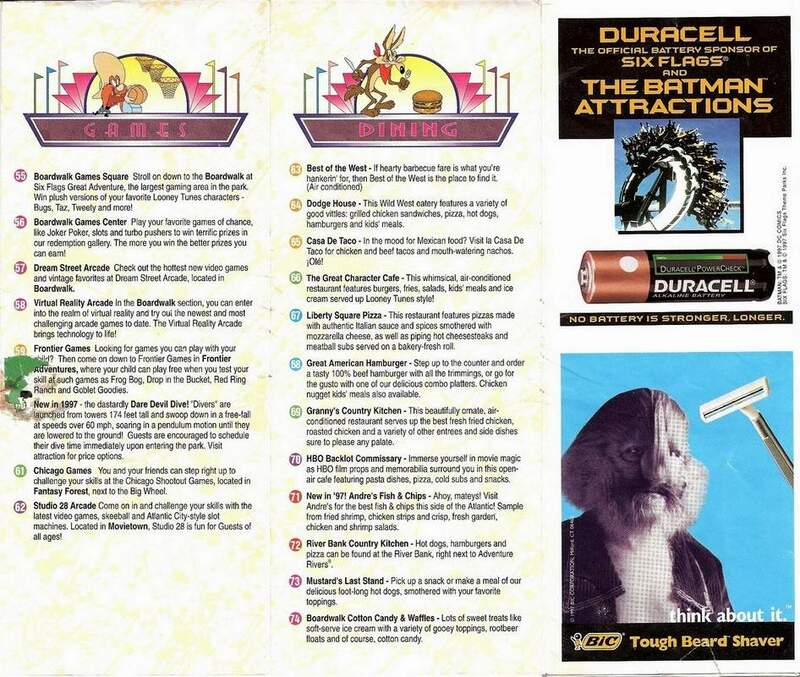 On the right we have yet more ads; one with Batman and how it runs on Duracells and another showcasing a razor that absolutely could not shave through the hair of some lycanthrope.